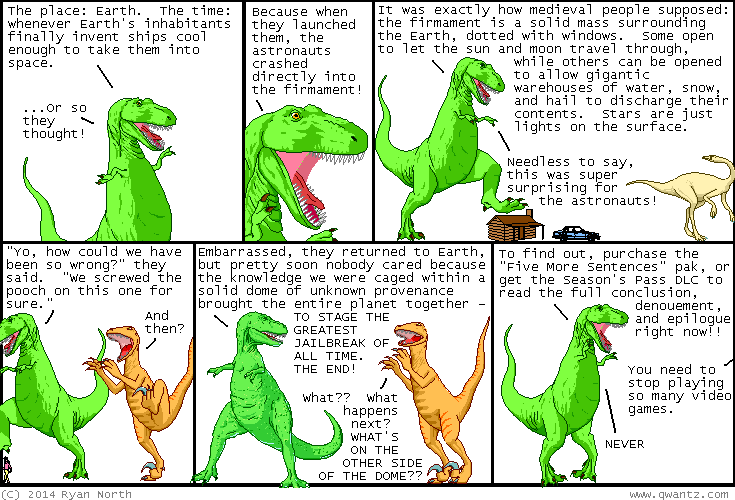 Dinosaur Comics - September 18th, 2014 - awesome fun times! –...Which is great, because that's what you'll be doing for the next 13 cycles! September 18th, 2014: Hey, remember when I wrote a choose-your-own-path version of Hamlet called To Be or Not To Be? SURE YOU DO. (YOU CAN BUY THIS BOOK RIGHT NOW, BY THE WAY). Well that book was launched through Kickstarter and one of the rewards was me painting a painting for you (I am a terrible but enthusiastic painter) and a very classy gent named Boyd Multerer backed at that level! It took me a while to paint it (and even longer to mail it, I'M SORRY BOYD) but it arrived yesterday and now I can share it with you! The request was "T-Rex playing Xbox" so now T-Rex playing the Xbox One is CANONICAL. Thank you Boyd!